New York State Becomes The Latest To Offer Free Tuition : NPR Ed Freedom's just another word for ... a full-ride scholarship, with strings attached. New York's vast new scholarship program has brought praise, and some nitpicking. New York Gov. 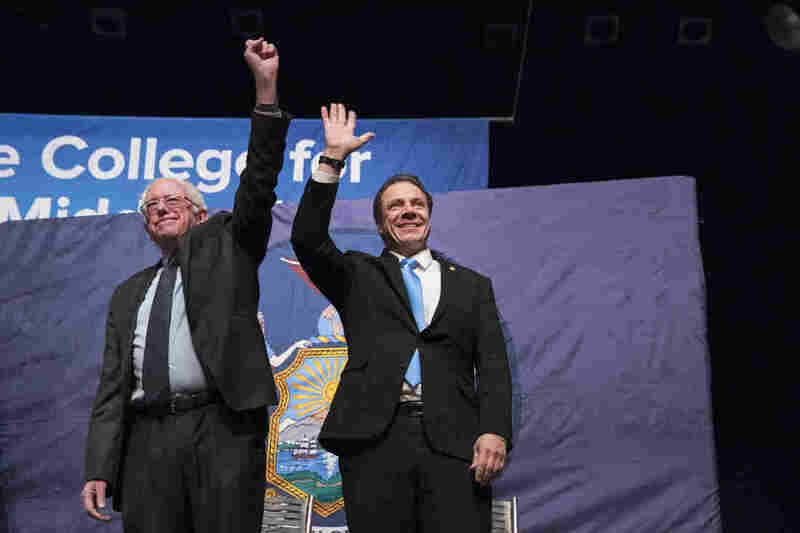 Andrew Cuomo (right) and Vermont Sen. Bernie Sanders at an event at LaGuardia Community College in New York in January. New York state has passed legislation that would create the largest experiment in the country to offer free tuition at two- and four-year colleges. The Excelsior Scholarship, approved over the weekend as part of the state budget, would cover full-time students in the State University of New York system, which totals 64 campuses and 1.3 million students. New York Gov. Andrew Cuomo, a Democrat, appeared with Sen. Bernie Sanders of Vermont and state education leaders in an event hailing the new program, which would begin this fall and is estimated to cost $163 million per year. Students from families making up to $100,000 a year would be eligible in the program's first year, and by the third year that would increase to $125,000 a year. It's a big step forward in a national trend: In the last decade, 85 states and municipalities have created similar scholarship programs, most of them for community college tuition. And the idea got plenty of airing in last year's presidential election, when it was championed first by Sanders and then Hillary Clinton. Still, now that free public college is closer to being a reality, the cheerleading is accompanied by nitpicking among some college affordability advocates. Here are some "catches" in the New York state plan. It's likely to benefit higher-income New Yorkers more. Tamara Draut, vice president of policy and research at Demos, a progressive-leaning think tank, praised the bill in a statement, but with a caveat: "The bill is what's known as a 'last-dollar' program." Translation: Students must first apply for, and use, other money like federal Pell Grants, before turning to the scholarship. That, in turn, means that low-income students have less to gain from the scholarship than do students from families who are too wealthy to qualify for those grants. By the way, the U.S. Department of Education and the IRS recently made it more cumbersome to apply for federal student aid such as Pell Grants. And, President Trump's budget proposal would withhold money from those grants. It pays for just half of the cost of attending college. New York has a higher-than-average cost of living. Books, fees, food, housing and incidentals aren't covered by this scholarship, so students without family support must work or borrow. "I have students choosing between a MetroCard and lunch, or sharing books with other students," said Gail Mellow, the president of LaGuardia Community College. She nonetheless calls Excelsior a "wonderful opportunity" and says that to complement the shift, her college will direct more of its own scholarship money toward living expenses. You must attend full time and finish on time. The Excelsior is good for two years for a two-year program like an associate's degree, or four years for a four-year program. That sounds reasonable, except when you realize that, according to the most recent numbers, just 34 percent of freshmen at public universities nationwide graduated within four years. Mellow sees this as a healthy incentive for students: "The data are incontrovertible: The faster you can get a student through college, the more likely they are to graduate." There are hardship provisions in the new program for students who must pause their participation. Still, given the number of students who struggle with work, child care and other responsibilities, this provision makes the program a lot less universal than it might seem at first blush. You must stay in the state. The Excelsior requires people to work in New York state for at least two years after they receive an associate's degree, or four years post-bachelor's. If they leave, the full grant retroactively becomes a loan. This is seen as a way to ensure that New York taxpayers reap their investment in the form of a more educated workforce. But Sara Goldrick-Rab of Temple University, a noted "free college" advocate, protested this idea at length on Twitter, calling it a "trick": "as someone who has worked on almost every free college bill, I promise @NYGovCuomo won't be remembered well if he keeps this provision." In another tweet, she noted that "Free college is about moving beyond a complex, untrustworthy aid system. This move perpetuates existing problems."